Art is often the expression of a person’s innermost feelings. And the beautiful sculptures created by young people with special needs were displayed at the third annual Friendship Circle art show. The Philly Friendship Circle(Friendship Circle Philadelphia Region South) connects teen and young adult volunteers to youth with special needs and their families, offering a full range of Jewish and social experiences. 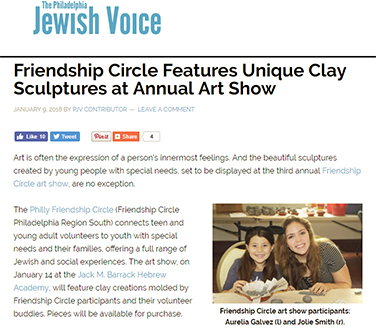 The art show, on January 14 at the Jack M. Barrack Hebrew Academy, featured clay creations molded by Friendship Circle participants and their volunteer buddies.